Some would say Zaya runs an unnecessary risk by declaring itself “the world’s finest sipping rum.” That’s a lot of live up to. Fortunately, from this rum-lover’s perspective, I don’t think their claim is all that outlandish. Zaya’s Gran Reserva 12 Year Old is hand-blended with 3-5 rums, five times distilled, and aged in white oak barrels for no less than 12 years. The result is an impressive, complex product that has earned notable industry accolades. Zaya was awarded gold at this year’s Ministry of Rum tasting in Miami, as well as double gold at the 2007 Spirit Competition in San Francisco. Initially a product of Guatemala, the company recently relocated their operations to Trinidad “to provide a plentiful supply of Zaya Rum without compromising on quality or taste,” according to a spokesperson. Apparently Trinidad was a natural fit given the island’s history of outstanding rum production. Zaya’s bottle, handsomely adorned with a wicker neck, shows off the 12 Year Old’s rich ruby color. The leggy pour takes on more of an amber hue as it hits the glass, then the nose opens considerably to reveal bright aromas of honey, walnut, and vanilla. The taste, rounded nicely with a slash of water or a few ice cubes, displays a crisp interplay between sweetness and spice. While syrup and oak are at the forefront, notes of coconut, cinnamon butter, and peanut brittle add depth. The finish is long yet subdued with a gentle heat and a spicy tingle. True to its slogan, Zaya is dangerously easy to sip. The overall effect is as balanced and complex as any rum I’ve tried in this price range. So, with an MSRP of $34.99 per 750 ml. 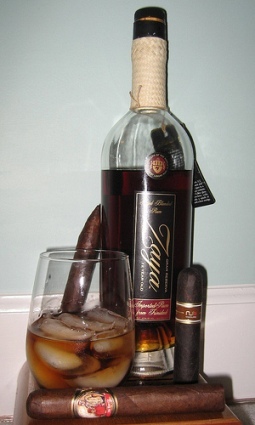 bottle (80 proof), Zaya Gran Reserva 12 Year Old is approachable in both taste and price. A great rum like this pairs well with most sticks, but I think the most complementary cigars run in the mild- to medium-bodied range and lack much sweetness. Try the Camacho Connecticut, Isla de Cuba Classic, or the Cuban Crafters Cubano Claro on for size. I trust you’ll be pleased. Thanks for the review! I agree that Zaya is a very fine rum. Zacapa 23 used to be at the top of my list until I tried the Zaya – they run neck in neck now and it's hard to make a solid decision there. When I've enjoyed the Zaya rum I've noticed a very faint flavor of bananas and vanilla, reminding me of a fabulous Bananas Foster.